“We loved it! You were sizzling with personality and charm — Your pipes were on a roll and could do no wrong! “You are made for the stage! I loved everything about your presentation! “…Charming and comedic and beautifully sung… I hope all the whooping and hollering and profuse affection cascading across the footlights were fun for you, as it was most well-deserved! Linda Lane Smith takes being raised on a farm to deliciously funny heights inher one woman show From Cows to Cadenzas™. From bails of hay to the elegant cobble stone streets of Vienna, Austria. Miss Smith enchants you with stories about her adventures around the world as an opera singer and how her “rural roots” helped her win European International singing competitions and performances. 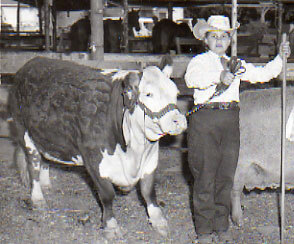 Linda Lane took grand champion in beef showmanship at the Hillsboro County Fair, with her Hereford, Annabelle. 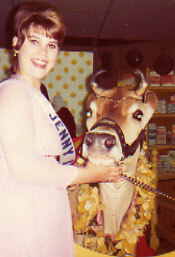 “Unlike the other two Jenny Linds, Ms. Smith showed no sines of nervousness.’ Here with Borden’s Elsie the cow, a Jenny Lind Competition sponsor. 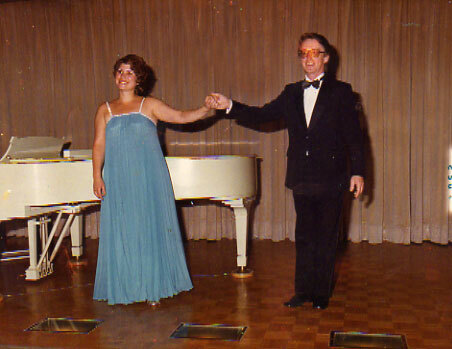 Linda Lane Smith with pianist Norman Shetler on the T.S. Maxim Gorki.